The Meyers Manx was made possible because of the design brief for the Volkswagen that Doctor Ferdinand Porsche was given back in the 1930’s. Dr. Porsche set about creating an inexpensive automobile that could pretty much go anywhere there was a track, go many places where there wasn’t a track, and do 100km/hr on a paved or even dirt road. The car was made with a simple air-cooled engine so there would be no coolant to freeze in the permafrost of north-eastern Europe, nor boil in the heat of northern Africa. It was made as a “go almost anywhere car” and that proved to be the secret to its longevity and popularity. 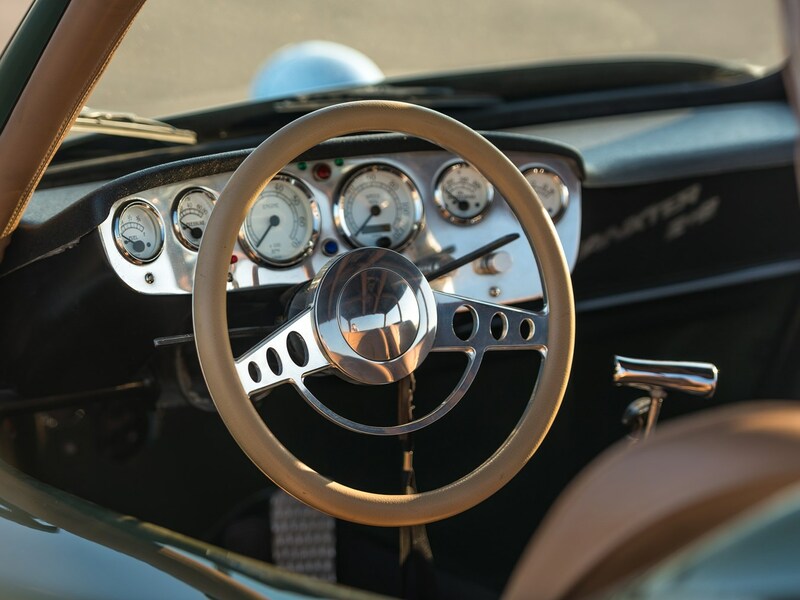 These features of the Volkswagen “Beetle” were what persuaded Californian Bruce F. Meyers to use Dr. Porsche’s Volkswagen as the base for his desert racing automobile the Meyers Manx. The Meyers Manx was a two-seater but the Manxter was made as a 2+2 four-seater. Bruce Meyers could see the potential in the humble Volkswagen, a potential that was there in part because the original car had been designed not only for civilian but also military use. Bruce Meyers first Volkswagen based dune buggy was made in his home garage and in building it he actually set about creating something that was more elaborate than his later production cars and kits. His first car, “Old Red” was based on Volkswagen parts but utilized a completely new fiberglass unibody and trailing arm rear suspension cannibalized off a Chevrolet pick-up. Meyers had experience in working with fiberglass in sailboats, and applying his knowledge and skill set to a dune buggy, led to him using curves and shapes from boat building. 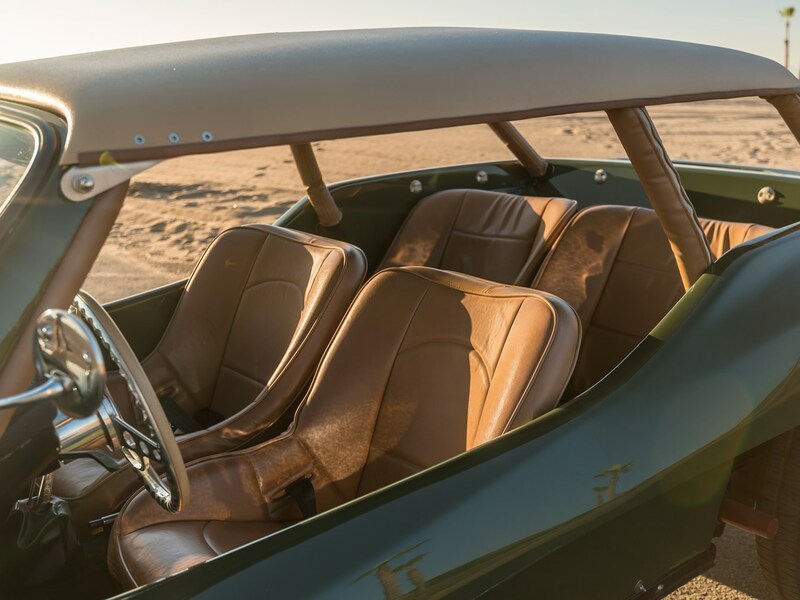 The resulting “hull” of the first dune-buggy featured the use of curved shapes to provide structural stiffness to the little car that would quite literally be “flying” across the sand-hills. The Meyers Manx and Manxter use fiberglass shapes reminiscent of sailboat construction. Bruce Meyers began making a few of his “Old Red” dune buggies but his elaborate unibody design made them quite expensive and he only sold a dozen kits of that style. Nonetheless his design was so good that he and a friend entered one in the Ensenada to La Paz race and they broke the previous record by an astonishing four hours. This led to the Meyers name becoming famous and he realized that he could get into the business of making Volkswagen based dune-buggy kits. 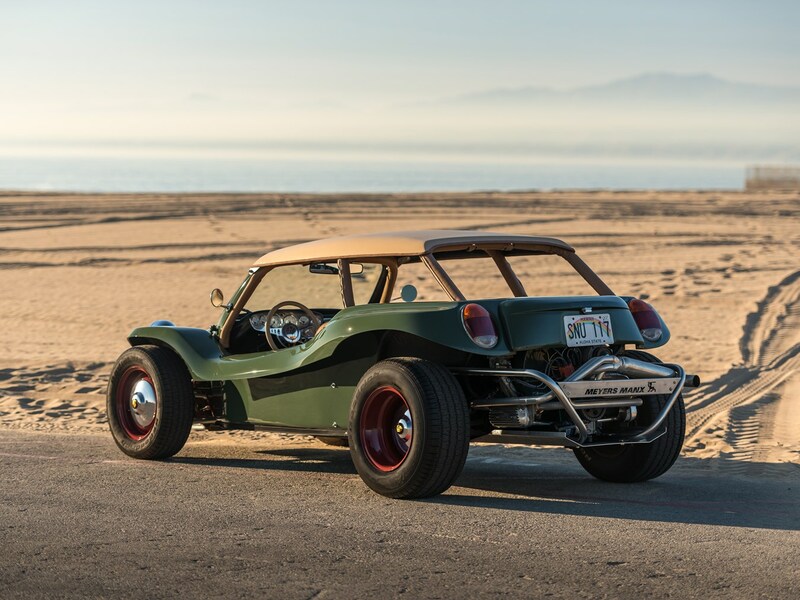 To reduce costs but still enable a great dune-buggy to be built, Bruce Meyers went back to Dr. Porsche’s original design and realized that the platform chassis of the original Volkswagen Type 1 “Beetle” was already an excellent base for a dune-buggy and even for a desert racer. 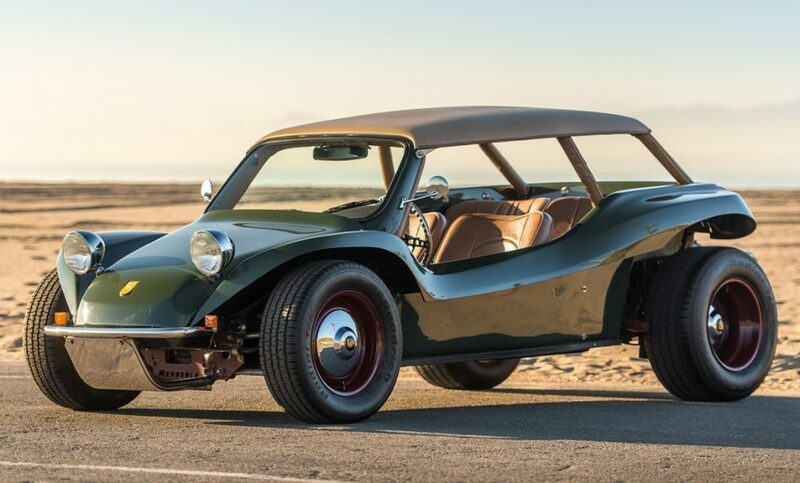 His next kit, the Meyers Manx Mk 1, was built on a modified Volkswagen Type 1 “Beetle” frame which made it significantly cheaper, but which still produced a great dune-buggy. The dashboard is a cross between fiberglass boat and car. Bruce Meyers discovered that the publicity and the new less expensive design both worked together for good and he was able to make and sell between 6,000-7,000 kits both as the Manx based on a shortened Volkswagen platform frame chassis and the Manxter based on the full length Volkswagen chassis, and able to seat four people as a true 2+2. It was not long however before a number of other people took notice and started making their own dune-buggies to compete with the Meyers original. An attempt to go to court and protect his patented idea was not successful and so Bruce Meyers created a new model, the Meyers Manx Mk II which was rather more difficult to copy. Nonetheless the writing was on the wall and Meyers left the company he had started before it went out of business in 1971. The Volkswagen engine fits into this 1965 Meyers Manxster 2+2 as snug as a bug in a rug. 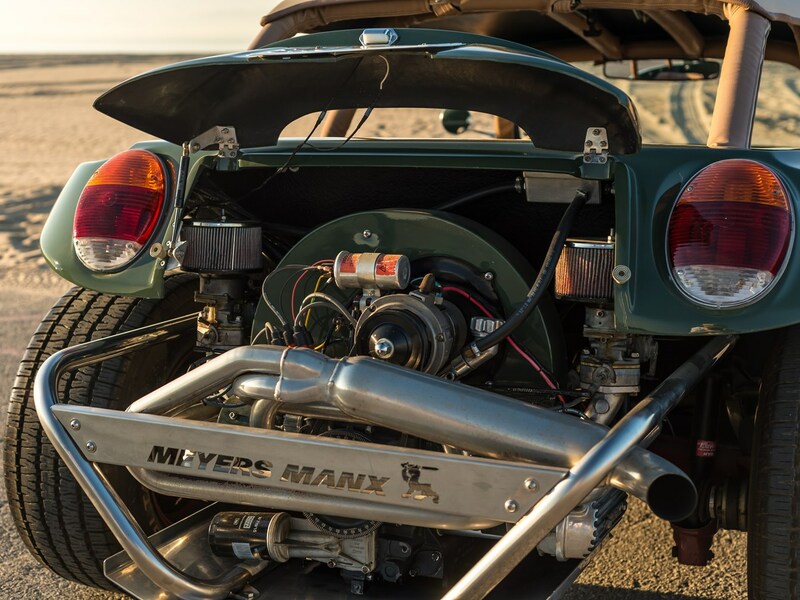 Bruce Meyers decided to get back into the dune-buggy business in 2000 and his new company is based in Valley Center, California. He began by producing a limited series of 100 of the original style Manx and then in 2002 re-introduced the Manxter 2+2. These new models can be based on the original Type 1 Volkswagen or the “Super Beetle”. You will find the web site for the new Meyers Manx kits if you click here. The fuel tanks fits neatly under the hood/bonnet. 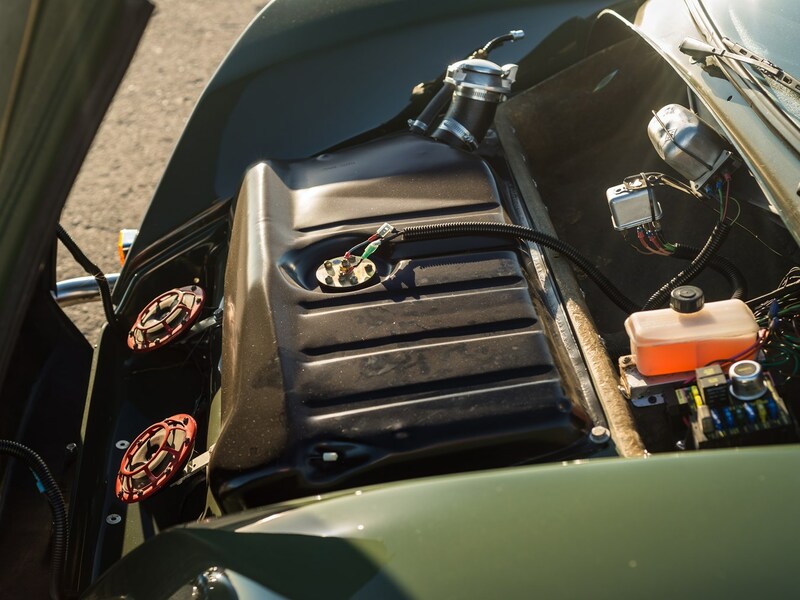 The green original 1965 Meyers Manxter 2+2 in our pictures is a collector condition example that has been subjected to a frame-off restoration. 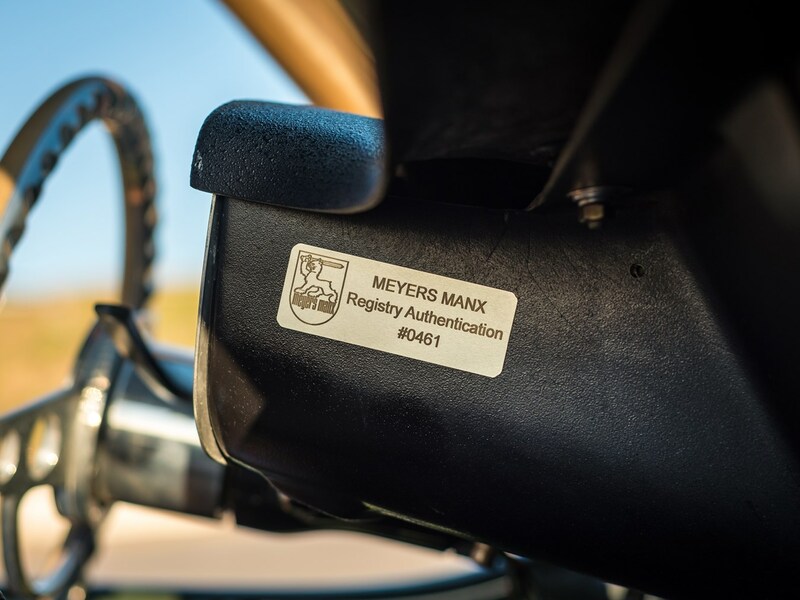 This buggy has Meyers Manx authentication plate #0461 and is coming up for sale by RM Sotheby’s at their Amelia Island auction, to be held on March 10th, 2018. You will find the sale page for this automobile if you click here. This car is expected to sell between USD$40,000 – $50,000 but is being offered with no reserve. These cars can only be described as “fun on wheels” and they work on-road, off-road, through the desert and on the sand-dunes, and as a shooting wagon too (the Manxter’s extra length makes it very suitable as a vehicle to get into your shooting spot and for carrying gear both in and out).